Using the first reading from 1 Corinthians 15:1-8, Pope Francis spoke about the transmission of the faith during his homily on Thursday at Casa Santa Marta. What transmission of the faith is not Transmitting the faith is not to be confused with proselytism, Pope Francis said. The Church is not about looking for cheering fans; neither is it simply reciting the Creed, which is an expression of the faith. 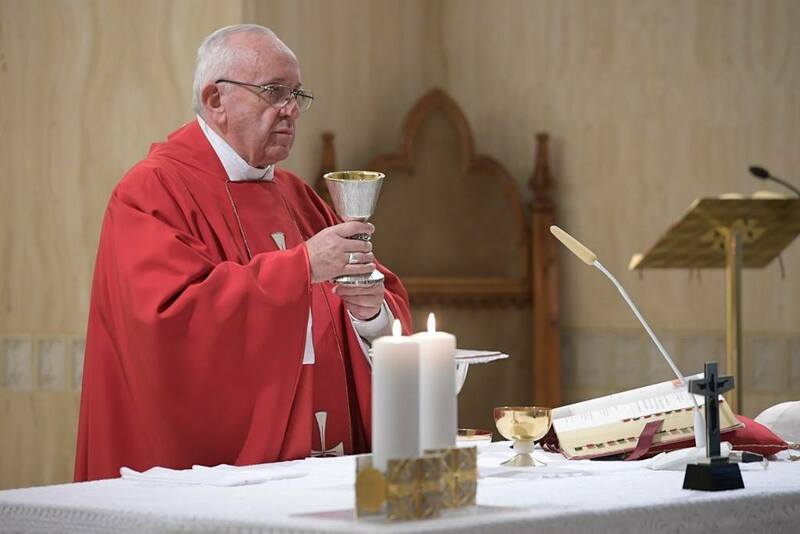 Neither is it merely the passing on of information as if it were as easy as: “Here, take this book, study it and then I will baptize you”, Pope Francis said. Faith is not given, it is birthed Rather, transmitting the faith is “rooting the heart in faith in Jesus Christ”, the Pope said. This is the Church’s challenge: “to be a fruitful mother, giving birth to children in the faith.” Grandparents, and parents are especially apt to transmit the faith because they “perfume it with love”, the Pope continued. And he added that care-givers, even if they are foreigners, can also effectively transmit the faith to those whom they care for. Quoting Benedict XVI, Pope Francis reminds us that the faith is transmitted when people are attracted by our testimony. At times, that testimony ends in martyrdom. “Testimony provokes curiosity,” he said. It is when others see a consistency in someone’s life that they are led to ask: “Why does so-and-so live like that? Why would a person spend their life in service to others?” “The Holy Spirit uses that curiosity and he goes to work within” the person, Pope Francis said. The Pope concluded saying, “Transmitting the faith makes us just, it justifies us. The faith justifies us and by transmitting it we give true justice to others”.